We are super super excited that today is the very first day of October and you know what that means right? HALLOWEEN!!! Having lunch with a friend last week, she asked us how we managed to stay colorful for the autumnal weather and whilst we admit it is a bit more of a challenge, bright bold colours are definitely are in for fall! This got us thinking about weddings and how we could apply our love of colour to autumn/ winter weddings, so where better to start than with pumpkins. 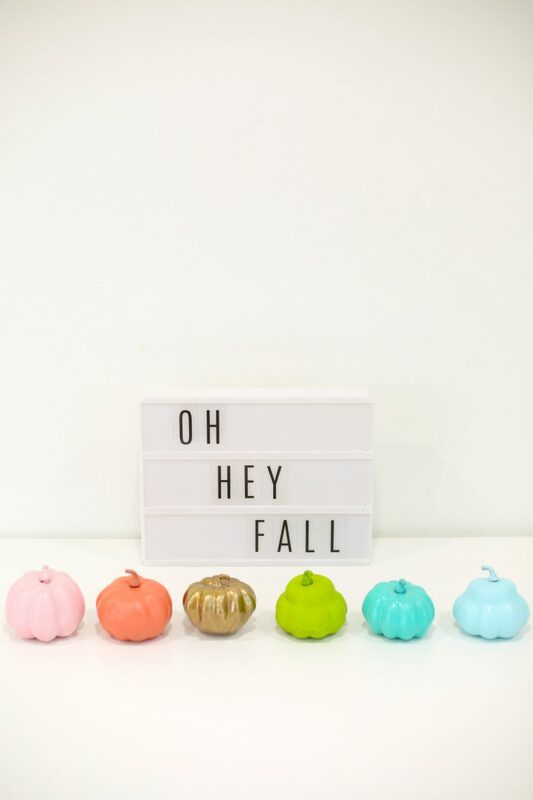 We have scoured the web for 12 of our favourite colorful pumpkin DIY’s and we promise there is not an ounce of orange in sight. 1. Pastel Pumpkin Cookies: For any of you that may be unfamiliar with the work of Deanna from Obsessive Cookie Designer, she is a cookie extraordinaire, making fancy custom sugar cookies for all to enjoy. These candy colored pumpkin cookies are a daydream and the perfect way to see in one of our favourite holidays. 2. Painted Mini Pumpkins: So mini pumpkins are just the cutest right, especially when painted in such fun colours! Don’t you think these would make awesome table decorations at a wedding, or even as little place name holders, oh, I would have so much fun with these! 3. Sequin Polka Dot Pumpkins: Polka dots are pretty much my favourite pattern so imagine my excitement when I saw it on a pumpkin! The gold against the white is so pretty and classy, whilst the sequins add a touch of glamour making it a great decor choice for a wedding. 4. Gold & Neon No-carve Pumpkins: This is one of my favourite pumpkin DIY’s EVER! They are just so funky! Painted in gold first, then with a touch of colour is super effective. 5. Decoupage Tissue Paper Pumpkins: Using tissue paper to decorate your pumpkins can add a cool textured look to your pumpkin and is a great way to use up any left pieces of tissue paper from gifts etc. 6. Halloween Party Pumpkin Pops: When I saw these cake pops, I couldn’t help but think how cool they would be on desert table at a fall wedding, or any event for that matter. This DIY is super simple and can be made in any colour to match your theme. 7. Gold Geo No-Carve Pumpkins: Here is another classy pumpkin DIY, this time with another of my favourite trends. Geometric never goes old and just by using some white paint and a gold sharpie, you can create these super stylish pumpkins which I think would make a gorgeous centerpieces filled with pretty flowers. 8. Fruit Pumpkins: If like us you were swept up in the tropical fruit trend that stormed this summer then you will love this fruity pumpkin DIY! 9. Tiny Message Pumpkins: You may have noticed that we are huge fans of a good slogan accessory over here, so these mini message pumpkins are right up our street. 11. Marbled Pumpkins: One of my favourite trends this year has been marble. Honestly I want to marble anything I can get my hands on, thankfully the cats have remained safe but anything that sits still long enough will be treated and I have a feeling pumpkins will be my next experiment. 12. DIY Pun-kins: Did I mention we also huge fans of puns? I mean who isn’t? I thought these were a really fun way to add a modern twist on your pumpkins and as a bonus they are super easy to make. Now if you will excuse me, I need to go and start planning our next pumpkin DIY. Let us know which one of these is your favourite? And for more pumpkin ideas follow us on Pinterest.